Electric mobility is a double-edged sword in Germany. On the one hand, we are fascinated by this forward-looking technology and highly interested in it. On the other hand, we are wary of the infrastructural challenges it poses and the high costs connected to them. Does Germany lack the courage for change? Germany likes extensive discussions. Countless conferences concerning electric mobility have been held, but not much has been implemented so far. Other countries achieve billions in turnover while Germany still ponders. Lacking financial incentives for potential buyers and a charging station infrastructure that is still sparse are the reasons why electric vehicles will continue to exist as niche products. Even though everyone actually knows that electric mobility is the future, we are still struggling with bad basic conditions in Germany. But where are the electric cars? If you are looking for electric vehicles, you have to take a look at the situation in some other European countries. There, electric mobility is already part of everyday life. In the Dutch capital Amsterdam, there is a very well developed network of charging stations. In Norway, the electric car Nissan Leaf is the second most sold car. In France, the small electric Renault Zoe sells better than comparable gas models, and in the United States, Tesla from California is a positive example with its electric sports car. Florian Fritsch is someone who believes in and promotes electric mobility. In Germany, he is considered to be one of the pioneers in this field and he demands more courage from German companies. “Electric mobility is the future. I don’t depend on gas stations, oil companies – that’s freedom for me,” explains Fritsch. He embraces this freedom in his own orange electric speedster produced by the Californian brand Tesla: The Tesla Roadster. 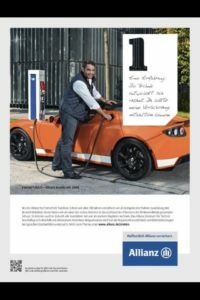 Apart from that, the entrepreneur actively invests into modern electric mobility: Already in 2011, he participated in establishing a charging station infrastructure in the town of Ulm in cooperation with the car-sharing provider car2go, which was very successful. In this respect, Fritsch explains: “They [the car-sharing concepts] promote acceptance, increase the rate of use and show citizens how easy it is to move around quickly, silently and environmentally friendly. There is hardly a more uncomplicated and comfortable way.” In his opinion, Germany, as a high technology country, cannot afford this restraint and the only very slowly advancing electric mobility development. Florian Fritsch successfully invests into future-oriented technology. The entrepreneur demands more courage and the will to invest into electric mobility.